click: Install an asset from HQ on Worlds Plaza and rez it, lowering its rez cost by 2, if able. What is the appeal of this card? Let's get the obvious bad parts of this card out of the way: yes, the Runner can trash this card and ALL the assets you've put on it for 5. That means, worst case scenario, the runner can trash four clicks and a bunch of credits worth of assets for cheap. So how do we stop this? By making it not cheap. The payoff you get is twofold: first of all, you get your assets cheaper. This can be huge for economy assets like Adonis and Eve Campaign, more disruptive elements like Hostile Infrastructure and Elizabeth Mills, and even pure value like Public Support. In this game of ours, cash is king, and Worlds Plaza can set up an asset economy fast and cheap. Secondly, you can defend your asset economy with a single row of ICE. This is the big apeal of the card, as the problem with Asset economies has always been that the runner can trash your stuff and you can never have enough ICE to protect them suffieiently while also scoring agendas. Worlds Plaza solves that problem by allowing you to make a four-deep server protecting your valuable assets. 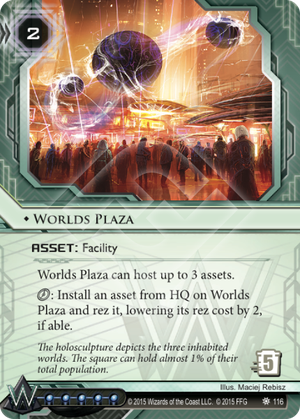 I think Worlds Plaza is an undeniably powerful card that may put Asset economies back on the map outside of Jinteki: Replicating Perfection. Powerful enough to, even at 5 influence, splash out of faction. It enables you to create an asset economy without fear of #Imp, by ICEing up your assets, as well as protecting all of them with a single Ash 2X3ZB9CY or Marcus Batty. Try the card in a glacier deck. You won't be dissapointed.